Women, especially those with a genetic history, age, and poor health, are more susceptible to strokes than men. Though this can be discouraging, it’s important to remember that there are many things we can do, at any age, to prevent strokes. The following tips will help you do all you can to keep yourself healthy! For those with busy lives, exercise often gets swept to the side. At any stage in life, exercise is important to maintaining cardiovascular health, as well as mobility, and general happiness. Depending on your age and level of mobility, options for exercise are endless. Many people grow up exercising, which makes it easier to maintain as you age. But, what about those of us who aren’t used to exercising, who perhaps have limited mobility, are weakened by an illness or injury, or are overweight? 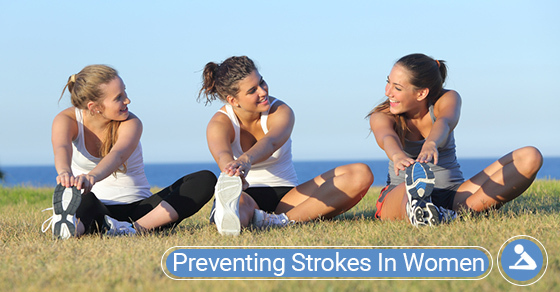 Those who avoid exercise for whatever reason, increase their risk of stroke. Walking: Walking is a great, low-impact form of exercise to include in your daily routine. Yoga: Many yoga studios offer classes for seniors, or classes for those with physical limitations. Swimming/ Water Aerobics: The great thing about swimming, or water aerobics, is that it’s low impact. Perfect for healthy joints! If you want to quit smoking but find it difficult, speak to your doctor. They will be able to provide you with whichever aid is right for you. When it comes to alcohol, drinking in moderation (about one drink a day) may actually lower your chances of having a stroke. However, once that goes up to more than one drink a day, your risk is increased. Make sure to drink in moderation, and if possible, choose red wine. Overeating salty foods, and other foods that are high in cholesterol such as deep fried food, red meat, and cheese, contribute to high blood pressure. High blood pressure, or hypertension, can put you at a high-risk for a stroke. When it comes to foods that are high in cholesterol, make sure to be moderate. Create a heart-healthy diet by eating lots of vegetables, fruits, healthy fats (found in fatty fish, and avocados), whole grains, lean meats, and low-fat dairy. These tips should not only decrease your risk of having a stroke, but should also contribute to an all-around healthy lifestyle, which is so important to have as we age.